How do I choose the correct surgical loupes for me? Please see our Surgical Loupes guide to help determine the best model surgical loupes for your personal needs. Which model loupe do I need ? What is the magnification I need ? The main factor in choosing a frames style is in fact your personal taste. ErgonoptiX offer a wide variety of frames to choose from. To help determine what Type, Size, Model frames you need, please see our Surgical Loupes guide. Do you have a local dealer in my country? 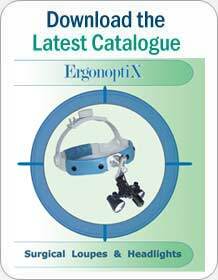 ErgonoptiX has local distributors and dealers in many countries. What is the best headlight for me? Choosing the best headlight for your self depends completely on your own needs, your working methods, and finally, also on your budget. Generally speaking, the smaller and brighter the light unit, the better. These days, (mobile) LED is by far the best option. Further, if you are a medical professional, surgeon, or dentist, you want to choose a light which will stay cool and not burn your fingers if you touch it. ErgonoptiX D-Light LED headlights, use LED cooling technology to ensure lower temperatures are maintained. What is a “Loupe mount” headlight ? A Headlamp with a “loupes-mount” has a special connection part to clip it onto loupes. 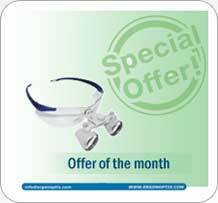 It is meant to be used in combination with loupes, and can be “clipped” on and of the loupes very easily. What is a “Stand-alone” headlamp ? A Stand-alone headlamp, is directly connected onto frames, head-band, clip-on etc. (using a “direct-mount” connection. It does not need to be connected onto loupes, and can be used by itself.